Everybody loves pancakes. Pancakes for breakfast, a weekend brunch, a snack or even a dessert? 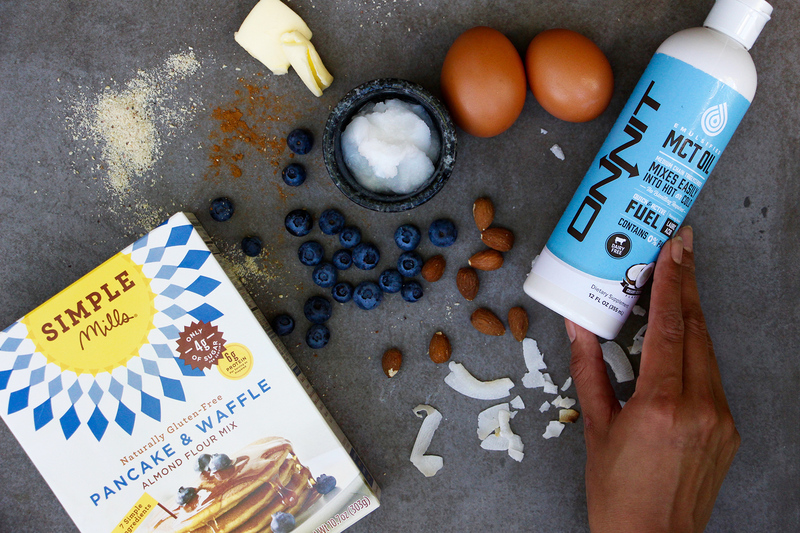 We know you enjoy them just about any time, but they have to be healthy pancakes, such as our Almond Flour Pancakes. To start you’ll need almond flour, almond milk, pasture raised eggs, coconut oil, canned coconut milk, blueberries, and cinnamon as well as a large mixing bowl, a wooden spoon, a large skillet and rubber spatula. For your almond flour pancakes topping you will need grass-fed butter, strawberry emulsified MCT oil, and raw coconut nectar or grade B maple syrup. Start out by whisking together the eggs, almond milk, coconut milk, and melted coconut oil in a mixing bowl. Mix in the cinnamon and pancake mix. You will want to leave the butter out while preparing the pancakes, so it softens to room temperature. Next, add coconut oil to a small skillet or pan on medium-high heat. Add about 2 tbsp. of batter per pancake. Sprinkle a few blueberries on top. When the batter starts to bubble, carefully flip the pancake. Once cooked, remove from the skillet and place on serving plates. Then, In a small bowl, add the softened butter and emulsified MCT oil. Mix or whisk to combine. Top the pancakes. Drizzle the coconut nectar or maple syrup, if desired. Repeat with remaining batter. 1. Leave butter out while preparing the pancakes, so they are room temperature. 2. In a mixing bowl, whisk together the eggs, almond milk, coconut milk, and melted coconut oil. Mix in the cinnamon and pancake mix. 3. Add coconut oil to a small skillet or pan on medium-high heat. Add about 2 tbsp. of batter per pancake. Sprinkle a few blueberries on top. When the batter starts to bubble, carefully flip the pancake. 4. Repeat with remaining batter. 5. In a small bowl, add the softened butter and emulsified MCT oil. Mix or whisk to combine. Top the pancakes. Drizzle the coconut nectar or maple syrup, if desired.